And I thought Round 4 with two of my favorite villains fighting off was more than a coincidence - now we have two doctors, both of them working with cybernetics, and leading an army of robotic drones. It's like it was meant to be! Let's take a look first at Dr. Scarab (and I apologize for his name getting cut off, I don't have the image to edit anymore). Dr. Scarab was obsessed with improving himself and his minions with bionics, but his were never up to par with his brother's, which were used on the Bionic Six family. In the show, he doesn't actually display a lot of powers of his own - he does have a bionic-detecting eye, and has a modicum of super-strength, tossing around Mother-1 like she was nothing. He can also change his appearance with a bionics masking device. But the one thing that will help him here is his army of Cyphrons, robots armed with energy whips and blasters. They're not particularly large or menacing but they're definitely numerous. I had a bit of trouble in his battle with Big Boss considering neither of them does much in their cartoons - Big Boss hardly ever leave his office or displays any powers, so I had to match up a few of each of their minions to fight. In the end, Dr. Scarab won just by scaring Big Boss into surrendering. Not much of a victory. On to Doc Terror, someone I had a lot more knowledge about since I loved Centurions as a kid. Doc Terror replaced a lot more than just an eye with cybernetics - half of his body is robotic! He's able to replace his robot hand with various weapons, including a claw and a blaster. Hid robot body doesn't show any super-strength as he's also not a real combatant, mostly relying on his drone army. As big as Dr. Scarab's army might be (especially since they don't really show how big it is), Doc Terror's absolutely dwarfs it. It's made up of four different models, built to operate on land, in the air, and on the water. He's also shown the ability to create a ton of different cybernetic drones very quickly out of local fauna, making robotic fish, whales, dinosaurs, and even people, all under his direct control. In fact, that's how he beat his previous opponent, Umbra from Mighty Orbots - he took control of the super-computer's Shadowbots and used them to attack Umbra directly. Considering both Drs. robot armies, Dr. Scarab is going to lose the use of his henchmen from his first fight. This fight will come down to which army is stronger, and whose mastery of bionic technology is stronger. The order screamed through flying fortress, sending all the pilots into a panic. Planes launched from the several hangars, each squad commanded by one of Scorch’s lead pilots. Hubbub’s group took off toward the north straight into a strafing run by two F-15s, one black and one blue, and was immediately shot out of the sky. Siren’s squad fared no better, being blasted upon launch by a silver, red and blue jet matching the other two attackers. Scorch watched the assault from the command center, witnessing his best pilots and their fighters destroyed one by one. Initially, he suspected the Ring Raiders as each of the jets was using incredible powers, like sonic booms and teleportation, but upon closer inspection, he found none of the jets had pilots and were either remote controlled or flying themselves. His second suspicion was confirmed when one more flier arrived, not a jet this time, but a giant flying robot, silver and black and wielding a massive cannon on his right arm. “Attention humans!” the robot boomed, the cannon aimed at Scorch’s command center. “I am Megatron, and I claim this base and all its weapons in the name of the Decepticons!” More robots showed up, surrounding the station and firing on every plane as they took to the air. As Scorch’s fliers all fell to the attacking forces, he realized the only course of action he could take. He left the command center and ran his jet, Scorch’s Torch. Instead of flying out its assigned hangar, he powered up the time portal systems. There was no saving the Skull Squadron fortress in this time, but if he could ambush his attackers before reaching it, he had a chance to save his evil empire. Megatron soared through the air, leading the Decepticons towards the flying fortress Soundwave had found on the radar. Megatron had never seen such an impressive structure created by the humans and instantly knew he had to steal it for his own purposes. Leaving his underwater headquarters, the trek to the fortress was short as it hovered above the very ocean the Decepticons hid under. As they passed through a cloud, a barrage of missiles flew past Megatron’s right and left. The incendiary ordinance slammed into Thundercracker, sending him crashing into Skywarp on his flank. Starscream just barely dodged the attack, railing against the indignity. “Silence, you feel!” Megatron yelled at his lieutenant as he scanned the skies for his attacker. He suspected the Autobot’s only aerial support, Skyfire, but when the flame-covered black jet split through clouds, pattering Megatron with fiery ammunition. Megatron halted, covering his face with his hands. Somehow, the heat of the gunfire hurt Megatron where no human weapons had ever affected him. It was a minor irritation, nothing capable of taking the Decepticon leader down, but still a shock. Starscream screeched past Megatron, readying a dogfight, but Megatron held out his hand to stop him. Starscream transformed and pleaded with Megatron to engage for almost striking him down and taking out two of his Seekers, who were already limping back to their base. “No, this human is mine,” Megatron growled. The black jet circled around for another attack, missiles and machine guns firing at full blast. Megatron flew up and away from the volley, avoiding the missiles, but still peppered with the gunfire as the jet followed him. Megatron spun to his side, getting behind the jet and prepared to fire a fusion blast, but in a flash a red light, the jet disappeared. A fiery explosion struck Megatron in the back, sending him flailing through the air. He twirled around again to see the jet had snuck behind him. Megatron dropped below the jet as it strafed by and disappeared before he could get a shot off. Again, Megatron was tossed through the air from a shot in his back and saw the jet disappear in a red flash. Megatron’s systems reported the massive damage to his back – even his armor wouldn’t be able to survive many more incendiary strikes like that. Anticipating another strike from behind, Megatron twisted around and fired off a shot of his fusion cannon. The red flash came again, the black jet emerging from the light just as the fusion cannon blast reached the location. The energy of Megatron’s cannon reacted with the portal violently, ripping the jet in half. The pilot struggled in Megatron’s grip, somehow strong enough to pry a little out of the metal hand. Megatron briefly considered studying this superhuman, before dropping him to the sea and following it up with another fusion cannon blast, obliterating the pilot into atoms. Click here for the respect post for Megatron and Scorch. In Scorch’s last fight, he won by using this time traveling powers to ambush his opponent. 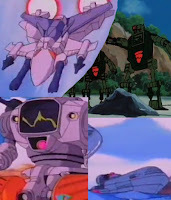 While that still provided a surprise for Megatron on the way to the location of the fight, Megatron’s armor has shown to be impervious to most human weapons. Besides catching the Decepticons off-guard, he didn’t have much of a chance to win. Even giving Scorch the benefit of his incendiary rounds being able to hurt Transformers (like the sabor rounds from the movie continuity) doesn’t work, since Megatron’s shown to be more impervious to damage than the ordinary Decepticon (like Thundercracker found out). Over time, he might have been able to take Megatron down, but I don’t think there’s any way Megatron wouldn’t have figured out how to take down Scorch before then. 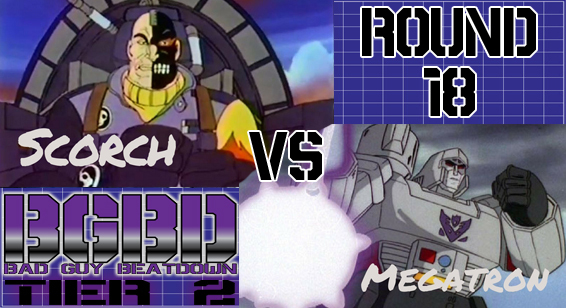 Click here to see who Megatron will face off against in the next tier. Click here to see the rest of the Bad Guy Beatdown battles. This one doesn't even seem fair - one of the most popular villains from the 80s with an appearance in every episode of his cartoon against a completely forgettable bad guy whose cartoon only lasted 5 episodes. Still, we've got an incredible power with time travel vs. one of the retreat-heaviest losers of all time. Luckily, I've already seen every episode I need, so let's get to the recaps. First, let's take another look at Scorch, the leader of the Skull Squadron, a band of villainous pilots who use time travel to pull of their (very few) evil schemes. He flies around in Scorch's Torch, an admittedly cool looking jet with flame decals on it. Supposedly, he has been bombarded with some kind of energy that gave him some invulnerability, but there's really no hint of what level that power was in the cartoon. Scorch made it to the second tier by defeating T-Ray from the Tigersharks. If you want to check out that battle, click here. For a quick recap, though, T-Ray came to Earth and, while his ship was much more armed than Scorch's Torch, Scorch was able to go back in time and ambush T-Ray, shooting him into the sea. Next, we're looking at my favorite bad guy, Megatron, but I won't let my personal bias play into it, because I know he's a chump. 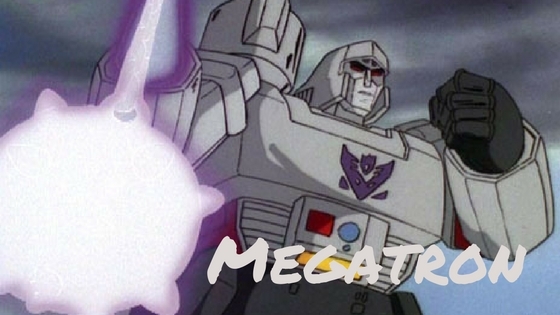 We all know Megatron's powers, but in case you didn't, he's an 18-foot tall robot from space with a cannon on his arm strong enough to blow a hole in a mountain. He's got an energy mace on one hand, can fly, and turns into a tiny gun. One thing to note is that he's shown to be impervious to practically any human weapons - but we'll see if Scorch's weapons are stronger than anything already out there. To get here, Megatron defeated MASK's Miles Mayhem, and you can check out the battle here. Megatron and Mayhem clashed while searching for a meteor, and while Miles was able to outmaneuver Megatron's aim, eventually, he was shot down. Mayhem's mask, Viper, was able to melt some of Megatron's armor, but not before Megatron crushed him in his hand. 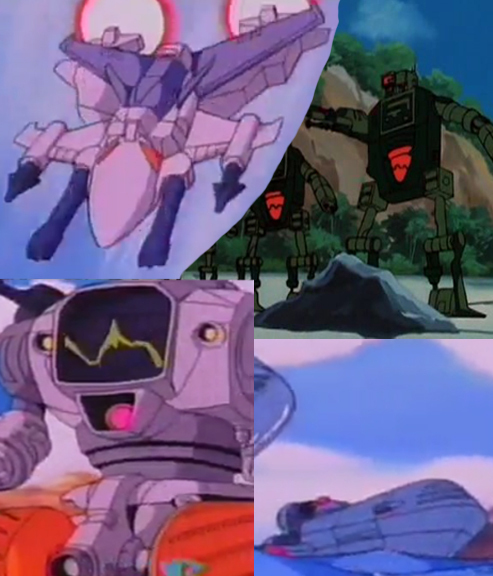 So we've already seen Megatron face-off against a skilled pilot, but will Scorch's flame decals help out more than a helicopter second mode? Let's find out next week. 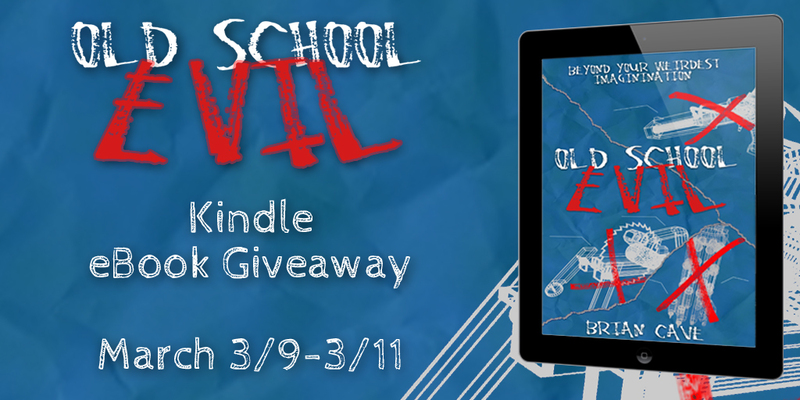 Before you go, I'll be giving away free Kindle copies of Old School Evil March 9th-11th. You can get a copy of it here. Skeletor stood at the base of the massive cliff and called out to the incredible power within. "Stampede!" he cried. "I've come to make a deal." To emphasize his point, he slammed the tip of his havoc staff into the earth, throwing up a cloud of sand. The entire planet he'd teleported to was nothing but desert and he found it to be even less welcome then the dark side of Eternia. He felt the dry wind blowing into his eyes every second he started there, his teeth gritting with every word. "Who dares summon me?" the booming voice responded. A thick cloud of smoke billowed to life before Skeletor, almost the size of a dragon. Skeletor stood his ground. "It is I, the master of evil, Skeletor, and rightful ruler of Eternia." "And what do I care of Eternia?" the smoke said, swirling into the form of a giant Broncosaur. It shot streams of harsh black smoke through his nostrils directly into Skeletor's face. After a brief cough, Skeletor laid out his plan. "If you grant me your power, I could finally unlock the secrets of Castle Grayskull. The Secrets of the Ancients could give us enough power to take over the Galaxy." Stampede thought a moment, drifting out of solidity when he did so. He materialized fully in front of Skeletor, along with a purple man in unfamiliar garb. "I'm curious about your offer, Skull-face. I'll gave you a portion of my power if you can best my champion." Tex Hex found himself in a very familiar situation; at the business end of Marshall Bravestarr's blaster. Thunderstick and Cactus Head were both unconscious in a pile of rock. “Your time as a free man is up, Tex,” Bravestarr said. Tex weighed his options and only a retreat seemed feasible. “I wouldn’t count on it, Bravestarr.” Tex drew out the Marshall’s name and followed it up with a cackle. “I’ll get you next time!” In a pillar of black smoke, Tex Hex dematerialized and blew away in the wind, aiming to go to his base at the Hexagon. Instead of appearing in his quarters though, he found himself forming at the base of the Hexagon’s cliffs, facing a blue-skinned man without a face. Stampede loomed over them both, swimming in thick exhaust, speaking of some kind of arrangement Tex didn’t catch. Without warning, the skull-faced man swung his staff at him and shot a blast of energy from the ram head atop it. Tex jumped back, barely dodging the attack and drew his blaster. He shot a volley of fire at his opponent, giant horseshoes capable of turning their targets to stone, and waited for his quick victory. To his surprise, the man caught the projectile in one of his hands and dropped it to the ground, unfazed by the magic imbued in it. 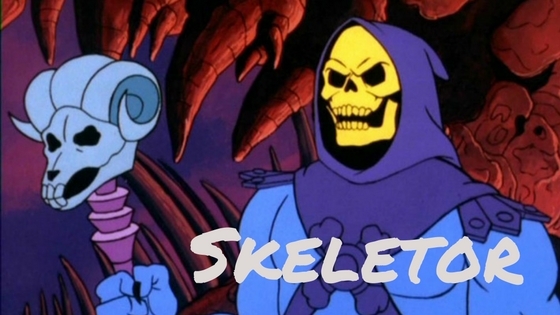 “You think you can defeat the mighty Skeletor with such pitiful magic?” he talking skull said. “I’ll show you true power.” He tapped his staff into the ground, sending a tremor through the sand towards a massive boulder. The rock shifted, rearranging the smaller rocks around it into a head and limbs. It stomped towards Tex, somehow roaring without a mouth, and snatched up the outlaw in a bearhug. “Ha! You talk too much.” Tex Hex pointed his hands at Skeletor and fired to beams of energy from his pointer fingers. The energy shot past Skeletor on both sides, striking a dead tree and transforming it into a colossal snake. It coiled around the wayward villain, but fell away a moment later when Skeletor teleported away in a flash of light. “It appears we are too evenly matched, champion.” Skeletor said. “Draw!” Tex yelled, slinging his pistol and firing at Skeletor as the other raised his staff and blasted. Both beams met in the air between them, unleashing a shockwave of energy. The beams surged back and forth as each villain fed the full force of their power into each weapon. Tex Hex fell to his knees bracing his weapon against the onslaught of Skeletor’s magic, the confluence of energy inching closer to him. In the end, the power in his blaster failed and Tex dropped his aim. The full power of Skeletor’s magic struck and incinerated Tex in an instant. “It appears we have a deal,” Stampede said as Skeletor hefted his havok staff over his head in triumph. Click here for Skeletor and Tex Hex's last respect post. A lot of people expected Skeletor to win this round hadily, and I'll admit I did too, but considering both villains are of the magical variety and from the same animation studio that gives everyone such random powers, it shouldn't surprise anyone that they're both even matched. Skeletor has control over the objects, either animating it as is or moving them around, but Tex Hex has the ability to transmute an object into a living creature. Both are able to shoot energy blasts with varying degrees of power, both can either teleport or turn into smoke to move around. And both have just weird powers that never show up more than once. Hell, Tex Hex could turn himself into a big monster, but it happens so infrequently, I don't think he'd even consider it in this fight. In the end it came down to whose magic was stronger, and I think Skeletor's comes out on top. Of all the stuff both of them can do, Skeletor can do with in bigger increments and with flasier results. Tex Hex doesn't provide as much of a threat as Skeletor does, and I think it comes down to who controls that power - Tex's comes from Stampede, while Skeletor's is his alone. Click here to see the fight that brought Skeletor to the second tier, and click here to see the rest of the first tier's battles. 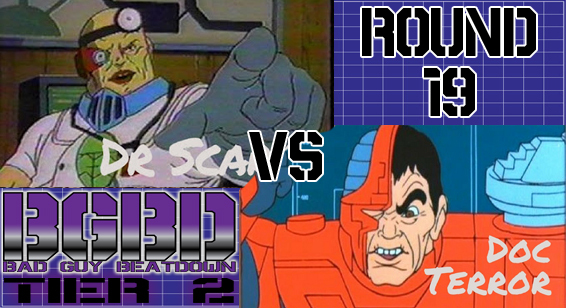 It's the battle of the Filmation Villains! I know the usual villain face-off would be Skeletor and Hordak, but seeing two magic-based bad guys fight is super interesting. Besides, we've seen Skull-Face fight his mentor before, who wants to go over that again? Before we get to the powers, let's recap how they got here. In Round 1, the Queen of the Crown kidnapped Evil-Lyn and Skeletor came to retrieve her. Even though the Queen was able to hold him off with her telepathic abilities, Skeletor was able to dispell them and then trap her with his control over the elements, trapping her in a metal cage. Even though he stole one of her Psychocrystals to amplify the power in his Havok Staff, he isn't able to keep it for this fight. In Round 2, Cy-Kill crashed on New Texas on the way to Gobotron and Tex Hex mistook him for Bravestarr's new steed. Tex Hex's ability to turn into smoke made him untouchable to Cy-kill's energy beams and being able to create monsters form the sand overwhelmed Cy-kill, allowing Tex Hex to crush his humanoid brain. As for powers, I've got Skeletor's down as he appeared in all 13 episodes I watched for Round 1 and you can check them out here. For Tex Hex though, he only appeared in 9 of the first 13, so I had to go back and watch more, but here's what I had before them. I found a few more examples of creating creatures out of sand or dead trees or whatever. There was one new power that was absolutely crazy - he shot giant horseshoes out of his blaster and if he hit a person with them, it would spin around them and turn them into stone. Obviously, it doesn't happen any other time in the episodes I saw (although the gun did make a cage materialize in the air) so I'm not keeping it in there. He did change into a big lizard/bull in one episode, making his shapeshifting powers official and usable in the fight. So we're going into this fight with some awesome powers and I can't wait til next week to see how they clash. 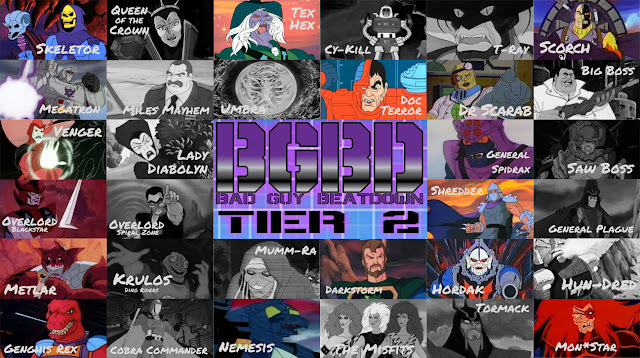 It's been a long time coming, but Bad Guy Beatdown is finally out of the introductory tier, shaving off the worst of the bad guys and leaving us with a group of winners, ready to take on their next fighter! Things are going to be a little different in this next tier. Originally the rules limited the amount of source material I could use to the first 13 episodes of a series. This was done to make it fair to some villains whose cartoons only lasted 13 episodes, or even less. However, if they won their first round, that advantage is no longer necessary. However, there are a few villains that didn't make appearances in all 13 episodes, like Mumm-Ra and Mon*Star, usually being replaced by random bad guys or just starring their lackeys. So now, I'll be watching extra episodes so those villains get all 13 appearances they're due. Respect posts will be shorter now as well. They will now feature a short recap of their powers (and any additional powers gleaned from additional episodes) and their first battles. Because most of the posts will just be restating previous posts, there should only be one week between fights, barring any personal distractions. If you want to see how each fighter arrived at this level, please check out the Bad Guy Beatdown page here! 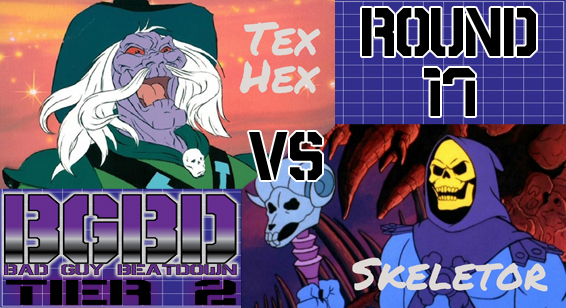 And come back next week to see our first fight, my two favorite Filmation big bads, Skeletor v Tex Hex! “You have something of mine, Warlord!” the voice boomed from outside Tormack’s fortress. “I want it back now, along with the weapon he stupidly came here to retrieve.” Tormack looked to his advisor and to the prisoner at his feet. The ox-like robot, chained and kneeling, snorted smoke and shied away from Tormack’s gaze. The old wizard waved his hands in the air creating a cloud of smoke which shimmered into an image of the outside of the castle. Above the fortress floated an orange armored and tentacled beast. “What sort of creature is that?” Krimm asked. The gate of the fortress burst open and a torrent of warriors flowed through. Six of Tormack’s mightiest Gerzas rode horseback, each one pointing a spear into the air and shooting beams of energy at the flying creature. The rider of the flying mount guided it higher and through each of the beams, avoiding them with surprising grace for such a large creature. “Enough!” he shouted and the stead flew down quickly. With each of its tentacles, it grabbed one of the Gerzas and yanked them off their horses. Flying in a circle over Tormack’s fortress, the beast through each of the Gerzas one by one over the surrounding cliffs. Tormack watched the defeat of his best soldiers, pathetically easy which infuriated him more than anything. The Gerzas were a force to be reckoned with, having taken over most of the world. This interloper had shamed Tormack, and though he had hundreds of more warriors to draw from to destroy this foe, Tormack felt the need to handle this one himself. 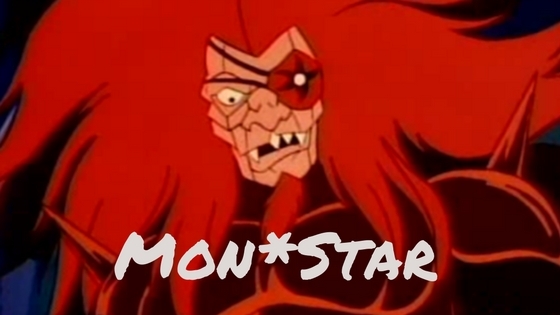 “Mon*Star grows impatient! Return to me what is owed! And don’t forget the interest!” Skyrunner floated above the fortress, bobbing up and down in the winds as if they were the currents of the sea. The creature let loose a trill as its tentacles weaved through the air. Below them, a lone figure road out of the gate that the unfortunate warriors had exited earlier. He was bigger than the others and held on his arm a shiny Sacred shield, no doubt the weapon Mumbo Jumbo was searching for. It would be worth a pretty credit, but no way could it stand up to the might of even Skyrunner’s laser cannon. Mon*Star shot off a volley of laser fire from the turret mounted on the underside of Skyrunner’s armor. While most of the blasts missed the rider, the final shot hit dead center. To Mon*Star’s surprise, the blast bounced off the shield and nearly hit Skyrunner’s tail. Another valley of beams garnered the same result - any shot that hit the shield was deflected with no harm to the wielder. Perhaps it was a special weapon after all; it could conceivably deflect that blasted Bluegrass’s musical attacks as well. “I will have that shield, warrior!” Mon*star yelled. “None but Tormack will possess the Sacred Shield’s powers!” the man replied, hefting his halberd into the air and shooting a torrent of energy blasts from the tip. The warlord’s aim was truer than any of his minions’ as the blast struck Skyrunner and destroyed its turret. Skyrunner bucked, flying backward and nearly sending Mon*Star into the air. “You’ll pay for that!” he yelled, pulling out his star-tipped rifle and setting his sights on Tormack. He pulled the trigger and shot a massive bolt of red lightning at the mounted man. The shot struck Tormack’s shield, and, though the attack’s strength was great, Mon*star saw that Tormack wasn’t affected at all by it, casually batting the energy away as if it were a ball of yarn. The cackling bolt returned a moment later, striking Mon*Star in the face and throwing him off his mount, tumbling toward the ground below. He righted himself and held his arms to his side, the rocket thrusters in his elbows lifting him back to his precious Skyrunner. He rubbed his metal face to clear the haze of the attack and steered Skyrunner away from another hail of lasers from Tormack’s halberd. “A lucky shot,” Mon*star shouted, the star over his left eye glowing red, “but nothing can protect you from the Light Star!” The glow on his eye flared, launching a disk of energy, the six points spinning like a saw blade. It buzzed through the air towards Tormack, who braced for the attack. Right before the Light Star could touch the shield, Mon*star controlled the star to stop and circle around to Tormack’s back. The projectile dodged around Tormack, cut a arc around him and struck the middle of his spine. The pain was instantaneous, throwing Tormack from his mount and causing him to writhe in pain on the ground. Click here for Tormack's respect post and here for Mon*star's. This battle was a lot closer than anyone really considered. Yes, Mon*star has a clear advantage with Skyrunner, which had a lot of offensive abilities along with flight. Taking out a group of ordinary Gerzas isn't too difficult for a giant space squid to take out, but I think a single enemy with better aim, which Tormack shows off, could keep Skyrunner at bay. 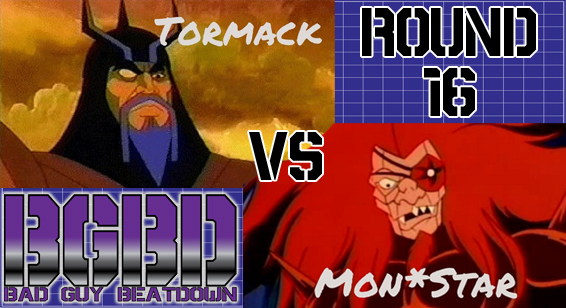 And with the Sacred Shield, none of Skyrunner's or Mon*star's basic attacks could touch Tormack. If Mon*Star didn't have complete control of the Light Star's trajectory, I could see this fight taking much longer without any clear winner. Even with it, if Tormack could expect it to move at Mon*star's whim, I think he could have held the Light Star off pretty well, but that might have made him vulnerable to Skyrunners arsenal. Click here to see Mon*star's opponent in the next tier, Nemesis from Robotix. Click here to see the rest of the first tier's battles.